Patek Philippe released a broad range of new models this year less than half a year after its extensive range of limited-edition 175th anniversary pieces wowed collectors and observers. Fully thirty-one new watches arrived to Baselworld from its now-expanding Geneva headquarters. Ten of these new models are ladies watches, with many of them line extensions, and the remainder are updates to dials and case metals to existing models in the men’s collection. 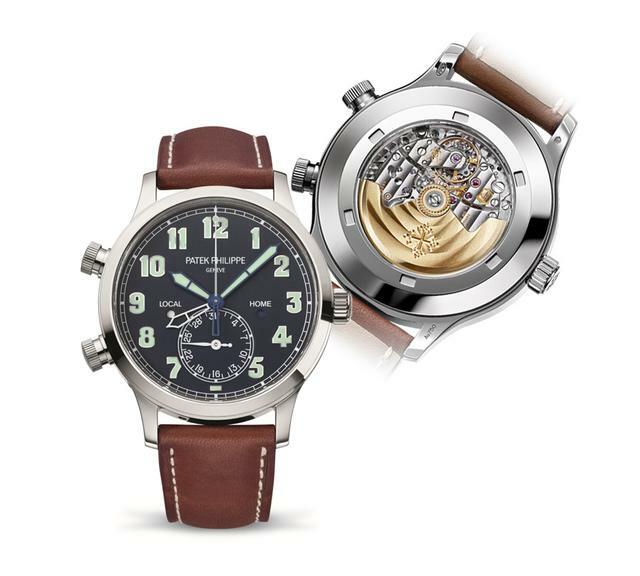 Three of the most-discussed men’s models, however, were complicated watches, a field where it would be an understatement to say Patek Philippe excels and often leads the way for so many other traditionally minded Swiss watch designers and manufacturers. Easily the most talked about of these three pieces is the Patek Philippe Calatrava Pilot Travel Time Ref. 5524, a 42mm white gold model that remixes the firm’s stellar and patented Travel Time mechanism, with its ability to display time in two different time zones, to create what to many contemporary eyes may appear an oxymoron: a Patek Philippe tool watch. And while its dark blue dial and large luminous Arabic numerals are a strange sight to many, especially when placed adjacent to a genuine Patek Philippe logo, this model is the real thing and does have several historic antecedents, particularly a few relatively rare pilot models made in the 1930s and 1940s. As with pilot watches from other brands, the Calatrava Pilot Travel Time is endowed with broad local-time hands and day/night indications for the local and home time zones. With screw-down pushers at the fairly novel 8 o’clock and 10 o’clock locations, the local-time hour hand can be quickly moved forward or backward in one-hour increments. The second, skeletonized hour hand shows the time at the owner’s permanent place of residence while the analog date at 6 o’clock is coupled with the local time. 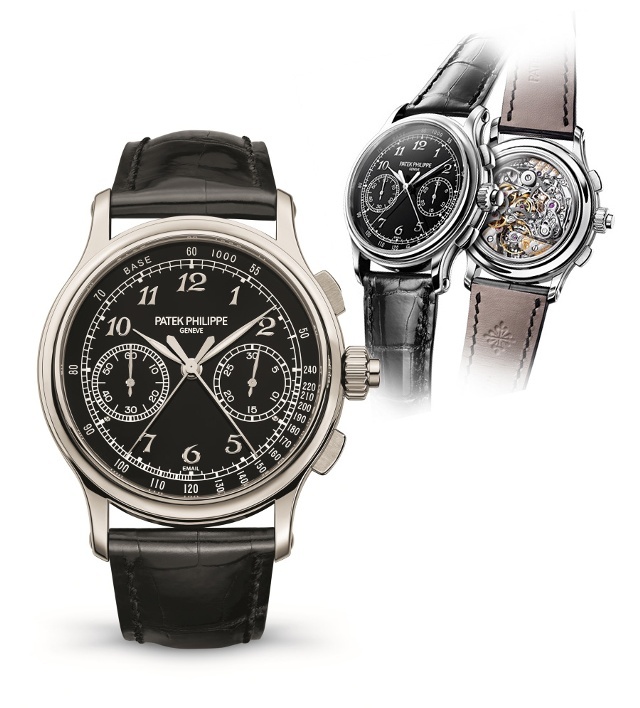 Two other complicated releases, the Patek Philippe Split-Seconds Chronograph Ref. 5370 and the Annual Calendar Chronograph Ref. 5905P, also were hot topics among collectors during the early days of this year’s Baselworld, though discussed with a bit less ambivalence. The 42mm platinum annual calendar, Reference 5905P,is inspired by the 2010 Annual Calendar, the popular Ref. 5205, but here adds new colors and details like a graduated minute scale and a large 60-minute chronograph counter positioned at 6 o’clock. The dial is available in navy blue and black. Price: $78,200. Stay tuned to iW for more details about these and other 2015 models from Patek Philippe.